"The Singing Butler" is Europe's best selling print, easily outselling even the likes of Monet's "Water Lilies." Vettriano has admitted to using a book, 'The Illustrator's Figure Reference Manual' as reference to create this masterpiece, using a then unknown pose by the struggling Irish actress, Orla Brady for the 'lady in red.' But this controversy seems to have only helped, not hindered the popularity of the print and its artist. 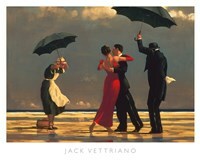 Vettriano, a self taught artist, is unashamed of his use of the book and he is so popular that in certain circles, he has even been dubbed "The People's Painter."